USB & AALA Event Management Co. proudly presents Lahore first international fashion show in accordance with Milan & French fashion week.Event to feature internationally acclaimed choreographers and Asia`s finest models from Pakistan & India. 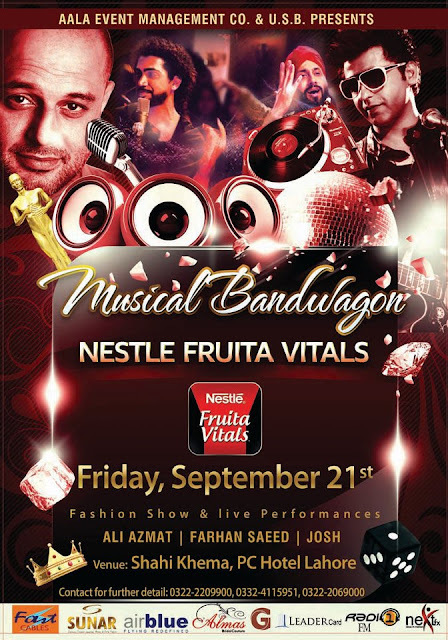 There will be live performances from Ali Azmat after huge success of Jism 2 Josh the band and Farhan Saeed. Tickets are available at Shapes Health Studio, gulberg. With every ticket of Musical Bandwagon there will be form attached. Please fill it and submit it with the ticket at the event to get your exclusive AALA Event Management Co. & USB LEADER CARD free of cost and avail unlimited discounts at your favourite Outlets with it.